The rise of digital CCO has created two broad market segments: scale-first CCO and digital-first CCO. The models are not mutually exclusive; regardless of model focus, there will be elements of both, and each will remain viable for providers in the next three to five years. Customers have stopped thinking about channels. It’s the experience that matters to them now – regardless of the channel they choose at any point of time. 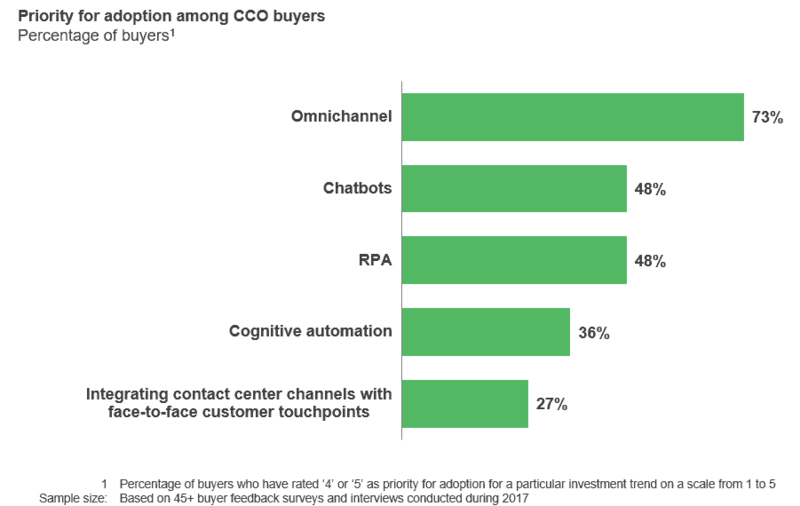 Thus, it’s no surprise that 73 percent of buyers responding to Everest Group’s 2016/17 Contact Center Outsourcing (CCO) surveys and interviews rated omnichannel as their top priority for adoption, and that 23 percent of buyers want to integrate the face-to-face customer touchpoints with their contact centers. Regardless of this intention, very few enterprises have achieved delivering a true omnichannel experience or built competitive advantage through exceptional CX. Challenge 1: Lack of strategic leadership support: Most omnichannel transition efforts lack direct involvement from senior leadership to prioritize investments, communicate urgency for transition, and mitigate any implementation roadblocks. This contributes to misplaced priorities and execution inefficiencies. Solution: An internal transition team consisting of experienced senior leadership can be set up to manage and drive the organization-wide change towards omnichannel. Challenge 2: Inadequate focus on human capital challenges: Omni-channel investment decisions are primarily focused on technologies and solutions. But even with sophisticated tools and technologies in place, lack of investment in human capital makes it difficult to practically achieve the desired outcomes. Solution: Organizations need to place equal importance on investments in human capital and begin their omnichannel transition efforts by assessing the talent requirements to manage omnichannel CX. Challenge 3: Organizational skills gap for omnichannel: IT teams often lack the necessary skills to support the integration of tools, channels, and databases. Contact center managers also require upskilling on sophisticated technologies, systems, and processes to effectively manage omnichannel contact centers. Agents, usually trained in supporting individual channels, have limited knowledge to work across multiple channels. Challenge 4: Historically siloed functions and channels: Lack of integrated front-office functions such as sales, marketing, and customer service with back-office functions such as business intelligence, reporting, procurement, inventory management, etc., makes it impossible to create a unified view about customers. Solution: Back-to-front office integration is crucial for a great end-to-end customer journey. The first step to achieving this is through customer journey mapping for all end-to-end processes to identify changing behaviors, capture unmet expectations, optimize processes, and encourage cross-functional collaboration. Challenge 5: Lack of clarity on requirements for data integration from all channels: Enterprises are not clear about the business and operational needs to support data integration across all channels. Management of disparate CRM, voice and other technology systems also hinder integration. Solution: Enterprises need to assess the implications of data standardization and integration across channels and identify an appropriate mix of tools to achieve integration of disparate datasets and applications. Challenge 6: Incompatible legacy systems: Most legacy systems in enterprises, especially CRM systems and voice technologies, are incompatible with omnichannel platforms and solutions. This leads to inconsistency in capturing and transferring data to achieve a unified view of customers in a single platform. Solution: Enterprises should adopt non-invasive omnichannel platforms and solutions that can seamlessly communicate with their legacy systems.